I've given you some strategies as you eat your food as well as several methods to cue into how your body is feeling before, during, and after the process of eating. As we move forward, we need to look out for certain habits that can overpower this awareness if given the chance. One habit with food that is very common in our society is to finish all the food on our plate. 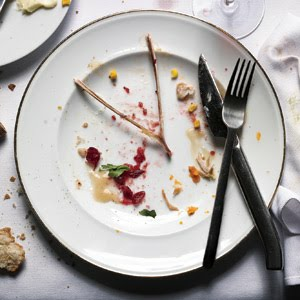 Whether it was your parents not letting you leave the dinner table before you finished your brussels sprouts or the mentality of needing to eat all of the food that you've paid for, it can be very difficult to leave food on your plate at the end of the meal. In order to break this habit, we need to reframe how we go about eating certain amounts of food. Perhaps you are very good at putting the proper portions on your plate. This is a great skill and is something that will serve you well moving forward! The reason this strategy can be helpful is because it ensures that you don’t eat more than you should simply because it's on your plate. However, it’s still important to recognize that just because you have put a specific portion on your plate, it does not mean that you need to eat all that food. Today, challenge yourself to leave some food on your plate at every meal. It could just be a little bit here and there or even just a bite. Exercising the willpower to stop eating because your body is satiated can be a really powerful thing. If you are at a restaurant and don’t wish to dispose of food that you've paid for, wrap it up in a box and bring it home for another meal! No judgment there.